Maybe don’t do that, though. 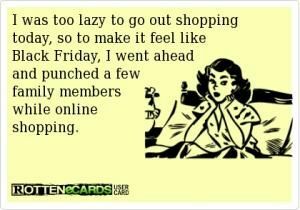 Let me help you out with your shopping today. Here’s a list of Black Friday deals in the beauty world. MAC Cosmetics. 25% off all orders. Benefit Cosmetics. 25% off all orders. Bobbi Brown. 25% off all orders, plus a free full sized gift. Make Up For Ever. 20% off orders over $100, now through 11/27. Urban Decay 20% off, plus free shipping. NARS. 20% off, now through 11/27. Armani. 20% off all orders, plus free shipping. A free full-sized lipstick with orders over $125, and a free makeup clutch with orders over $300. Laura Mercier. Free smokey eye set and free shipping with orders over $75. Some of these deals extend into Cyber Monday, while others don’t, which makes me think those companies will have new deals on Monday. Either way, Happy Shopping!